I just finished two short story collections, Other Worlds Than These & Stories of Your Life and Others, now I move on to two epic novels, Les Miserables & Infinite Jest, so you might not hear from me for a while, book-wise. But I enjoyed reading these collections immensely; short stories are so often the way to go. Not only can you read them quickly and/or in bursts, losing nothing by taking breaks between tales, but often these truncated plots are able to shine far better than their longer counterparts. Some authors have trouble wrapping up; for example, my favorite author Stephen King. His novellas are by far his best, creating great characters, setting up frightening stories, and then getting out before the audience gets bored. Ted Chiang succeeds in that manner here, making his points quickly in each of his shorts in this collection, leaving us with food for thought but also with a hunger for more. 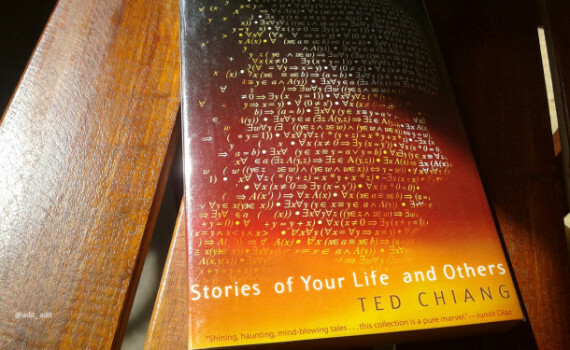 Stories of Your Life and Others is a collection of eight Chiang short stories, ranging across time & space, earning the sci-fi label perhaps but not becoming anything like the Asimov fiction we’ve come to anticipate from that term. Chiang instead presents fictionalized science, developing theories, worlds, or technologies that don’t exist, but explaining their functions as if they do. In Tower of Babylon, Mesopotamian Yahweh-worshipers build a tower to God, breaking through the firmament to reach him. In Story of Your Life, an alien language teaches humanity to look at time from a different perspective. And in Hell Is the Absence of God, catastrophic visitations from angels are a common occurrence, changing the lives of those who witness their heavenly descent. Eight stories in all, describing ideas that don’t exist as if they are the absolute truth. A fascinating approach really, and a fun way to read a collection. Chiang presents a science, for example the growing of sperm into inert humans, as if it is commonplace, relying on his readers to get on board with the concept and figure out the moral behind the tale. In the last story in the book, humans have developed a technology that allows them to blur the appearance of beauty in human faces so we can judge each other on merit, not on looks. It’s this type of concept that make these stories great, developing ideas that will literally blow your mind, all while you remind yourself that they aren’t real. Chiang tends to become a little wordy, a little over-scientific, and there are stretches where I got a little bored. But, taking each story one at a time, there is a lot here to jumpstart your imagination, curiosity, and conversation.